In case you haven't already heard of it- some time ago I stumbled upon a free open source DIY 3D printed humanoid project. I ended up printing one hand/arm on my Solidoodle 2 printer with fantastic results. The files are simply amazing. Gael made all the parts available for anyone who wishes to reproduce an entire humanoid robot at a bargain basement price. Looking forward to seeing this advance. I am a Korean living in Busan, Korea. who lost his right hand and also his right wrist due to a terrible car accident long time ago. respect to electronics needed to make it. for those kids with Amniotic Band Syndrome). First off- Sorry to hear about your friends issue but I'm super excited you are starting your project! I saw that post/video on the DIY hand they made and I was blown away. What a truly exciting time to be involved with making in general. When DIY prosthetics are out preforming commercial ones- things are truly amazing. My unit would not be well suited for a prosthetic at all. 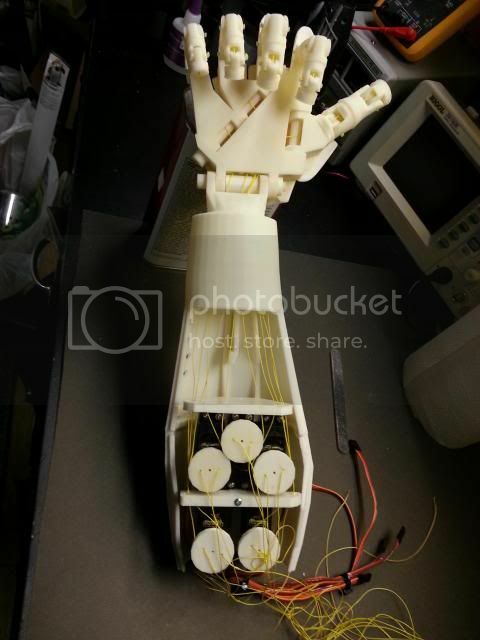 Gael (who made the entire InMoov project) is actually making a prosthetic version right now and I think it is nearing completion. You may want to check it out. Anything I can do to help- Let me know!